The gift of them - Let's keep that in the sanctity of your brain, shall we? 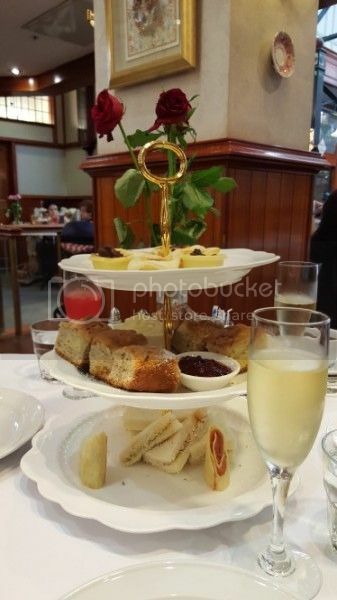 Jay and Jess took me out to a tearoom in the city yesterday, where High Tea was consumed, with quite a bit of champagne as well as tea and coffee. It was a real treat! Afterwards they came back to mine for the rest of the day, only leaving in the evening as they had chores to do before the beginning of the working week. And do you know what I realised? Apart from the fact that I am so very lucky to have them - it wouldn't have mattered if we'd gone somewhere or not, yesterday. They gave me the gift of their time, and that is most precious to me of all. Oh it was lush indeed. I meant to take a pic of the dessert buffet as well but it was always surrounded - two large tables crammed with tiny individual mousse cups and tartlets and jellies, in all colours of the rainbow. It was marvellous! Sigh...a tea room, high tea and most importantly, company. What a lovely gift! It was the best Mothers' Day gift, just being with them and sharing the day. The high tea was the cherry on top. High tea sounds like such a lovely tradition. But I know what you mean. You don't have to do anything special to enjoy loved ones. It was a lovely day, and their company alone would have been enough. The high tea was a bonus. They gave me the gift of their time, and that is most precious to me of all. It sounds like you had a marvellous Mother's day! Hello,you're back! Or - just popping in when you can? Either way, nice to see you, and thank you. ♥ I just re-read my entry and it sounds so corny, but it is so true.